As levels of reproductive hormones decrease, as is common with the transition into menopause, many women turn to a treatment known as hormone replacement therapy (HRT). Although HRT can help balance levels, women should inform themselves thoroughly before use. To learn more about hormone replacement therapy, including what HRT is, what HRT is used for, and various types of HRT medications, keep reading below. Hormone replacement therapy is what doctors call treatment that introduces outside hormones into the body when natural hormone production decreases. 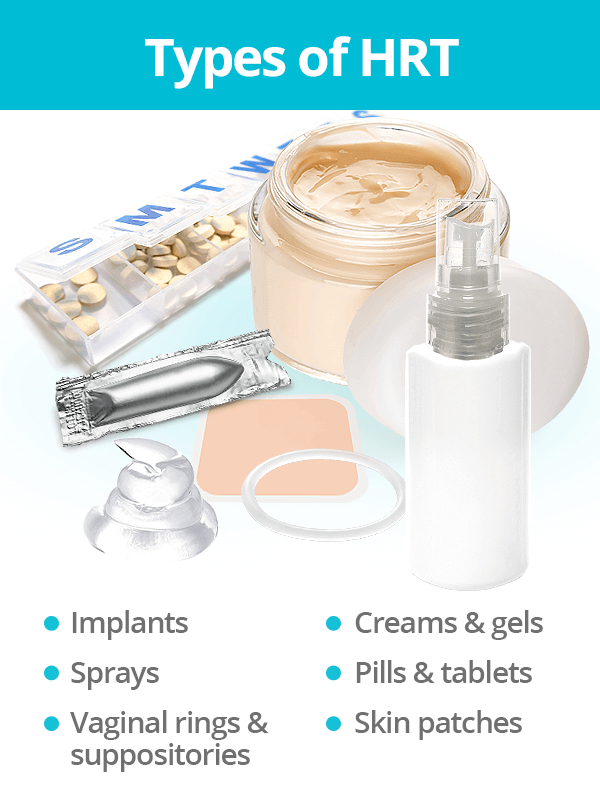 Natural HRT hormones.Also known as bioidentical hormones, natural hormones are synthesized from plant sources and are structured to function the same in the human body as endogenous hormones. They are claimed to be safer than syntheticHRT preparations. Synthetic HRT hormones. Synthetic hormones, as their name suggests, are chemically made as opposed to being derived from plants or animals. Synthetic estrogens include dienoestrol, ethinyloestradiol, and mestranol, and synthetic progesterone hormones include dydrogesterone, medroxyprogesterone, and levonorgestrel. Throughout women's reproductive years, the ovaries create key reproductive hormones that guide the menstrual cycle and support the health of other bodily systems. Then, when transitioning into menopause,the ovaries slow down hormone production, resulting in unbearable symptoms. Because HRT combats a natural hormonal deficiency, treatment helps to relieve symptoms of hormonal imbalance, including hot flashes, insomnia, night sweats, vaginal dryness, irritability, night sweats, fatigue, and many more. Women and their doctors will need to choose from among the varying types of HRT medications according to their preferences, symptoms, and health. Follow the link to have a better understanding of types of HRT so that you can feel confident about deciding on the best option for your health. Estrogen-only. This treatment regimen is for women who have had a hysterectomyand, therefore, no longer need progesterone, which is the hormone that sustains the uterine lining. All of the uterine tissue needs to have been removed to implement estrogen-only HRT. Cyclical combined.Cyclical combined HRT involves taking hormones (most commonly estrogen and progesterone) at different stages throughout the month. Because it is for women in perimenopause, this HRT regimen is meant to normalize irregular periods so women know when they naturally stop. Continuous combined.This is the practice of taking two or more hormones, most commonly estrogen and progesterone, simultaneously with no breaks. Because this treatment is recommended for postmenopausal women, recipients of continuous combined HRT will not experience a monthly period. 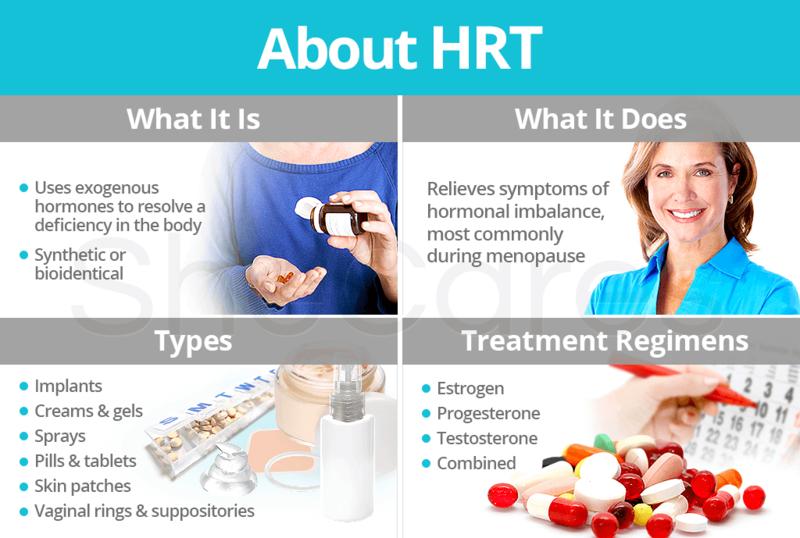 Continue reading all about common hormones for replacement therapy by clicking on the preceding link in order to keep learning all there is to know about HRT before deciding if it's right for you.